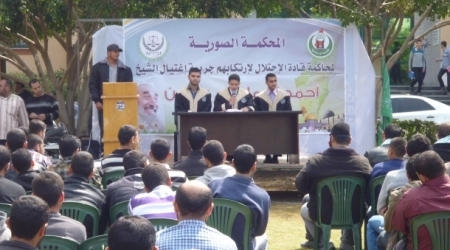 University students in Gaza organized on Monday a mock trial for the killers of Sheikh Ahmed Yassin on the 10th anniversary of his extrajudicial assassination. Head of Sharia and Law Club of Islamic University’s Student Union, Mohammed Abu Hashem said the moot trail is a model of International Criminal Court (ICC) in which we hope that killers of Sheikh Yassin tried. "Martyrdom of Sheikh Yassin has been an awakening for Muslims and a beacon for the martyrs, so we should always remember him as one who boldly defended the Palestinians’ rights and paid his life for them," Abu-Hashem added. For his part, former prisoners' affairs minister, Mohammed al-Ghoul insisted that those who shed Sheikh Yassin's blood will be accountable for their action. "We will continue to demand for this right; it is not subject to any statute of limitations,” he said, adding that Sheikh Yassin’s murder is a war crime according to the international law. 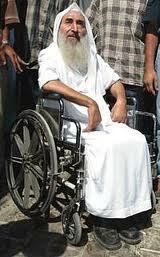 Sheikh Ahmed Yassin, the founder of Islamic Resistance Movement-Hamas and national resistance leader, was extra-judicially assassinated in an Israeli air strike on March 22, 2004 after performing Fajr prayers. A number of youths wearing Vendetta mask attracted Hamas festival participants, who reacted with chanting revolutionary slogans. According to masked activists of “Ultras Aqsawi” Team, Vendetta mask symbolizes revolution and resilience, and their participation comes to support Hamas Movement against all challenges and conspiracies. They also want to emphasized that revolution and resistance are the only way to liberate Palestine from the Israeli occupation. Team member, Mahmoud Bassam, said that the team was formed six months ago in Rafah, southern Gaza Strip and has more than 500 members today. The Ultras cheers during the Hamas festival are for Palestinian rights and constant, and in support of the steadfastness of the besieged Gaza, he explained. Vendetta mask has had widespread popularity across the Arab countries during the “Arab Spring” revolutions, which made it an icon for resisting dictatorships. Back in history, Vendetta mask dates back to the time when Jay Fox, who rebelled against the British monarchy and attempted to bomb the English parliament building in 1606 assisted by other rebels who wore masks. However their plan failed and Fox was executed. In 2005, famous director James Mktejo had one of his ‘V for Vandetta’ movie cast acting as rebel Fox. Moreover, 'Anonymous' hacking group believed to be pro-Palestinian uses this mask when making cyber attacks against the Israeli occupation. Vendetta is originally an Italian word that means revenge. Gaza premier Ismail Haneyya briefed both Yemeni president Abed Rabbo Mansour Hadi and Moroccan premier Abdulilah Bin Keiran on latest Palestinians developments. In the two separate phone calls on Monday, Haneyya explained latest Israeli violations against the Palestinian people and holy shrines. Bin Keiran affirmed his country’s support for the Palestinian people and their just cause and their right to resist occupation. Palestinian President Mahmoud Abbas is expected to call on Arab leaders to reaffirm their commitment to the Arab peace initiative, as well as to ask world leaders to view the proposal as the best plan for ending the conflict with Israel. According to senior Palestinian officials, the call by Abbas and the Palestinian Authority leadership to activate the 2002 Arab League peace plan, and to put it back on the agenda of the league's summit in Kuwait later this week, is aimed at deflecting U.S. pressure on the PA not to withdraw from the negotiations with Israel. The plan calls for pan-Arab normalization of relations with Israel in return for an end to Israel's occupation of Gaza, the West Bank, East Jerusalem and Golan Heights, along with its recognition of Palestinian refugees' right of return or of compensation. 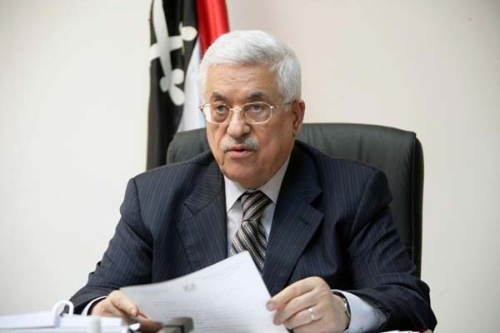 A senior Palestinian source told Haaretz that Abbas does not have high expectations from the summit, but does expect the Arab foreign ministers to adopt the Palestinian position regarding the talks with Israel, including a rejection of the Israeli demand for recognition as a Jewish state. Abbas hopes that by reviving the 12-year-old Arab peace initiative, he will send a clear message to both Israel and the United States that this option will not remain on the table forever. "The Arab states, with Palestinian support, presented a fair package deal that could bring an end to the conflict, but so far no one has expressed serious interest in the product, instead treating it as though it were rotten; therefore we are returning the offer to the agenda specifically at this time, when the Americans are trying to advance the peace process," said a senior PA official involved in the summit's organization. At the same time, Palestinian and other Arab figures do not dismiss the possibility that one of the participating states might propose taking the Arab plan off the table in the event it does not win broad support. Abbas has other things to worry about as well, starting with Israel's scheduled release, at the end of the month, of 30 Palestinian prisoners: PA officials reject any attempt to link the release with their continued participation in the negotiations with Israel, saying they made their position very clear in the recent visit to Washington. "After nine months we've received thousands more homes in the settlements, the demolition of hundreds of homes and more dead Palestinians, so we're asking what will happen if we agree to extend the talks, where will it lead?" said Fatah official Mohammed Shtayyeh. Palestinian minister of interior affairs Fathi Hammad said that his ministry supports the back of the Palestinian resistance factions through protecting and strengthening the internal front in times of war and calm. In an interview conducted by Al-Aqsa satellite channel on Sunday, minister Hammad stressed that his ministry works day and night on maintaining the internal front cohesive and strong, especially through combating espionage activities. The minister also hailed the Palestinians in Gaza for their steadfastness in the face of Israel's aggression and blockade, and appealed to all Arab besieging parties to support Gaza and its resistance. "The siege will end, God willing. There are people who have forsaken the Palestinian people, but God is with us and we are a nation that loves martyrdom for the sake of God and does not give up its constants," Hammad underlined. He also criticized the Palestinian Authority security apparatuses' cooperation with the Israeli occupation in the West Bank and described its role as "shameful". In a special ceremony Solomon's Pools Tourism Company, and Holy land for inbound tourism offices Society signed agreement aims to put Solomon Pools, which reflect the historical stage and considered a tourist centers, cultural center and a nature reserve reflect the beauty of the nature in tour programs to Palestine.The agreement was signed under the auspices and presence Palestinian Minister of tourism and antiquities Rola Maiah. The Minister of Tourism said in her speech that the ministry is trying to increasing the number of sites to be visited by foreign tourists to beyond the traditional to visit religious sites, in order to increase the length of stay in Palestine. anew tourist markets, such as conference tourism, and it will help employment, and increase Palestinian resources.Mazen Karam, Chairman Board for Directors of Solomon's Pools stressed the importance of this tourist site, which includes historical Solomon's Pools, and Murad Castle, and Museum, and the Mall of Sultan Bazaar and Palace of Congresses.Maiah indicated that the ministry aims to develop the Palestinian tourism program and make it a diverse and includes religious, historical, cultural and natural places and this means increasing the length of stay in Palestine and an increase in profits for the tourism sector. He also pointed to the importance role of tourism offices to make this place a destination for tourists and their contribute to turning it into a destination for tourists from around the world, Karam and announced that the company is currently studying the establishment of a park, a hotel, and an amusement park on the site. Sami Abu dahya president of Holy land for inbound tourism offices Society said that Solomon's Pools has tourist and historical importance as it has a role in the conference tourism. He added that the association, which comprises 43 companies and tourist office, will cooperate with Solomon's Pools, through the five-year plan, with the aim of promoting tourism in Palestine. George salfetee director of Solomon's Pools explain all terms of the agreement, including joint action to develop programs for tour groups, who are looking for conference tourism and religious educational and cultural tourism. Palestinian premier Ismail Haneyya said that the Israeli occupation's war threats against the Gaza Strip and its population are gone forever and the Palestinian resistance hides surprises for it more than it can imagine. Premier Haneyya made his remarks in a massive festival held on Sunday by the Hamas Movement to commemorate the death of its founder and spiritual leader Ahmed Yasin. Haneyya warned the Israeli occupation that it would pay dearly if it dared to commit any aggression or folly against Gaza. "We have swept you off Gaza when we had nothing but a few of weapons and when you were oppressing us in Saraya cells in Gaza, but today, thanks to God, we have become stronger and the resistance of our people has evolved exponentially," the premier stated. "What happened in Jenin yesterday confirms that the Palestinian people are united by the resistance and divided by the negotiations," Haneyya added. "Some people, who have narrow considerations, think that the calm that hangs over Gaza is the calm of the weak and submissive; however, the response came quickly that Gaza is an active volcano and able to make the victory," the Palestinian leader emphasized. "We, the Palestinian people, are facing difficult trials, but we are not in crisis. We have experienced hardships and challenges, and this is not the hardest time. Here we are today celebrating the anniversary of the martyrs spearheaded by Sheikh Ahmed Yasin, the miraculous Sheikh," he stressed further. 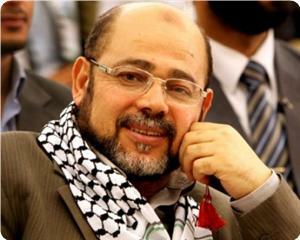 Member of Hamas's political bureau Mousa Abu Marzouk criticized the Palestinian Authority's persistent security cooperation with the Israeli occupation against the Palestinian people and their resistance. "We are surprised by the failure of everything with the Zionist occupation, except the security coordination against the resistance," Abu Marzouk stated on his facebook page. The Hamas official also hailed the bravery of the three Palestinian young men who were killed yesterday by Israeli soldiers in Jenin refugee camp and held the PA security apparatuses responsible for their death. He said that the blood of these martyrs would be a curse on the Israeli occupation and its allies. In another context, thousands of Gazans participated on Saturday in a massive protest called for by Hamas and Islamic Jihad to condemn the Israeli murder of the three young men during a violent raid on the same day at dawn on Jenin refugee camp. Scores of angry Palestinians marched in Jabaliya refugee camp in Gaza, chanting slogans in support of the resistance and calling for avenging the death of the young men. Tunisian President Mohamed Moncef Marzouki stressed that the Tunisian people will always support the Palestinians, and that the Palestinian cause will remain one of Tunisia's most important issues. 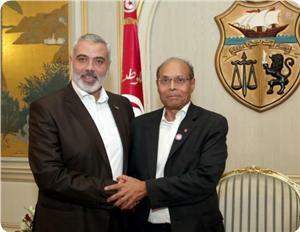 This came during a telephone call between Gaza Premier Ismail Haneyya and the Tunisian president on Saturday evening. Haneyya urged Marzouki to place the Palestinian cause on the top priorities of his agenda in the upcoming Arab summit scheduled to take place at the end of this month in Kuwait. He has also briefed Marzouki on the current events and developments in the Palestinian arena; pointing to the escalation of the Israeli occupation’s Judaization plans and settlement activities, the continuation of blockade on Gaza and the continued violations against the Palestinian people. 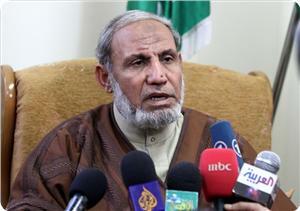 Member of Hamas' political bureau Mahmoud Al-Zahhar categorically denied that his Movement has ever interfered in the internal affairs of the Fatah Movement. In remarks to Al-Aqsa satellite channel on Saturday, Zahhar said that the differences between de facto president Mahmoud Abbas and former Fatah official Mohamed Dahlan proved that Hamas is innocent of all accusations made against it. He explained that the renewed dispute between Abbas and Dahlan proved that Hamas is innocent of causing the inter-Palestinian division, undermining Makkah agreement, and many other accusations, including its interference in Egypt's internal events. The Hamas official called for dealing legally with the wrangling between Abbas and Dahlan and looking into all allegations made by both sides in a court of law. 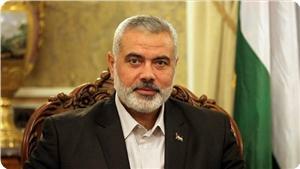 He accused Fatah figures of being behind the accusations leveled by Egyptian parties against Hamas. Gaza fishermen say that they caught large numbers of rare batfish off the Gaza shore on Sunday morning. 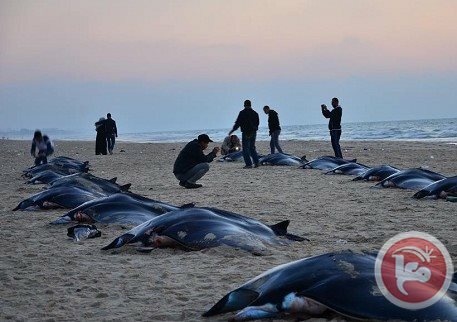 Speaker of the Gaza association of fishing and sea sports Mahfouth al-Kabariti told Ma'an that the batfish arrived in flocks of hundreds, and he said that they weigh between 50-250 kilograms (110-550 pounds). Until last year, the fish had not been seen off Gaza's shores since 2008. 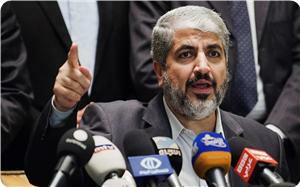 Hamas, the Palestinian Islamic resistance group, is coming under attack from many quarters these days. Israel is constantly attacking the group and its supporters. Indeed, not a day passes without Israeli occupation forces rounding up Islamist activists, even those uninvolved in any hostile activities against Israel's Nazi-like occupation and "lebensraum" policies. Mostly innocent people are arrested and made to languish in Israel's notorious detention camps for years, effectively without charge or trial. From the Israeli viewpoint, ideological opposition to the Israeli occupation on the part of the Islamists is a sufficient reason for detaining them for prolonged periods. It is also widely believed that Israeli repression of Islamist activists in the West Bank is carried out in a tacit coordination with the Palestinian Authority (PA). The latter denies any complicity. However, the seemingly close security coordination between the two sides should leave no doubt as to the cooperation between the Israeli occupation army and the various Palestinian security agencies operating in parts of the West Bank. Indeed, Israeli political and military officials routinely praise the "close security cooperation” with the PA. In fact, one could go as far as claiming that serving Israeli security interests constitutes the ultimate raison d'être of the PA.
For those unfamiliar with the current Palestinian reality, security coordination is no less than a euphemism for repressing every form of resistance against Israel. The "security coordination" between Israel and the PA has actually prompted some Palestinian intellectuals to refer to the PA as a Palestinian "Judenrat." "Judenrate" is a German word denoting the Nazi-supervised, Jewish run institutions in Nazi-occupied Europe during the WWII, tasked with carrying out anti-Jewish policies. 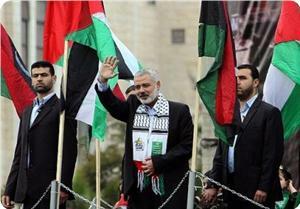 The PA is run by Fatah, which views Hamas as its ultimate political and ideological competitor. Fatah is a secular organization which opposes Islamic political influence in the Arab world. Historically, Fatah effectively allied itself with tyrannical regimes in the Arab world, a policy that alienated many Arabs and Muslims. Fatah breathed a sigh of relief when the Egyptian army carried out a bloody military coup against the only democratically-elected president in Egypt's entire history, Muhammed Mursi, last July. Unfortunately, the resulting decapitation of democracy along with the bloody repression of the Islamists, who played by the rules of the democratic game and won all the elections that took place in Egypt following the overthrow of long-time autocrat Husni Mubarak, had no effect on Fatah. Last week, Fatah leader, who is also PA Chairman, Mahmoud Abbas, called the Sissi Coup a "great revolution." He also called the manifestly brutal murderer "a great leader." It is uncertain though that Abbas did really mean what he said or was just practicing sycophancy toward Sissi. I personally know Ahmed Assaf, the Ramallah based Fatah spokesman. This week while on a visit to Egypt, Assaf sought to curry favor with the Egyptian junta. He was quoted by the Egyptian media as saying that Hamas and ousted President Muhammed Mursi conspired to create an alternative Palestinian state in the Sinai Peninsula. The concocted incredible claim had been voiced by the pro-Sisi media, notorious for its disinformation, misrepresentation of truth and mendacious propaganda. Of course, the mindless repetition of these lies only cheapens Fatah's overall discourse. Even professional liars, e.g. the Israelis, wouldn't make such an illogical lie. Indeed, for Hamas to agree to the establishment of an alternative Palestinian state in Sinai or elsewhere outside Palestine means that Hamas would be willing to liquidate the paramount right of return. But this would constitute the ultimate antithesis of Hamas’s Islamic ideology. Indeed, were Hamas to involve itself in such a "thundering treachery," the group would be effectively committing the ultimate act of treason with the Palestinian cause and people. And the movement would suddenly morph from Israel's ultimate foe to Israel's ultimate friend and "peace partner" at the Palestinian arena. More to the point, Ismael Haniyeh, Khalid Misha'al and other leaders of Hamas would be invited to the White House for a high-profile audience with President Obama! But of course, Hamas will not commit adultery with the Palestinian cause, which makes millions of Palestinians, Arabs and Muslims as well as honest men and women around the world respect the group. This principled and admirable steadfastness in the face of aggression from Israel, vociferous vilification and conspiracies from Fatah and unmitigated persecution from the Sissi gang is what makes many people in Ramallah visibly angry. 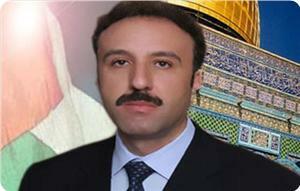 I advise Mr. Assaf to ascertain the veracity of his accusations before publicizing them. Truth is always more important than scoring some temporary propaganda points. Besides, Palestinian factions must always guard rather meticulously against importing the Egyptian political culture into the Palestinian scene. We all know that culture is based on lies, rumors and unsubstantiated accusations. Have we forgotten Ahmed Said?! The chairman of the political bureau of the Hamas movement Khaled Mishaal said that Palestine can only be liberated through the resistance, and stressed that his movement wants to end the internal division in the Palestinian arena. Mishaal, in a speech he delivered at the University of Qatar on Thursday, called for unifying the Palestinian political system and conducting democratic elections. He stressed that the Palestinian people will never give up the path of resistance, especially the armed one, until the liberation of their land and holy sites. He noted that Gaza has been able to produce rockets and dig tunnels, and has created a military structure that has withstood in two wars against Israel. The head of Hamas's political bureau denied what was published by some media about the movement's leadership being pressured by the Qatari leadership. He hailed the Qatari leadership and people for their positions supporting the Palestinian cause. Concerning the situation in Egypt, Mishaal said: "There is no doubt that what happened in Egypt has affected Hamas and Gaza, in particular, and has unfortunately participated in tightening the siege on our people in the Strip." 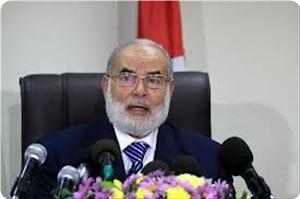 However, he stressed, the events taking place in Egypt are internal affairs and his movement has nothing to do with them. First deputy speaker of the Palestinian Legislative Council Dr. Ahmed Bahar has asked PA chief Mahmoud Abbas to issue an urgent presidential decree ending security coordination with Israel. 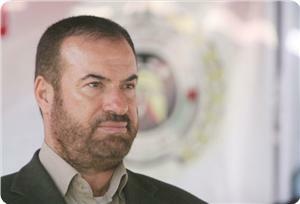 Bahar said in a terse press statement on Saturday that the step would be in retaliation to the Israeli crime in Jenin. Three Palestinians were killed in a clash with special Israeli forces in a pre-dawn raid Saturday on Jenin refugee camp. Hamas movement mourned in a press statement on Saturday the three martyrs in Jenin and hailed the Jenin refugee camp residents and all its factions and military wings for confronting the Israeli occupation forces (IOF). The movement urged the PA and its security forces to halt security coordination with the Israeli occupation, and to release all the political prisoners immediately. It also called on the Palestinian people and factions to unite their ranks and to adhere to resistance as the only option to liberate Palestine and to respond to the occupation’s crimes and abuses. For his part, spokesman for the movement Fawzi Barhoum said: "What happened today in the Jenin refugee camp represents a heinous crime," and held the occupation government responsible for its repercussions and consequences. He also accused the Palestinian Authority of complicity in the killings. Three Palestinians were killed and seven others were injured early Saturday during armed clashes with Israeli troops in Jenin refugee camp, in the north of the occupied West Bank. The three martyrs were identified as Hamza Abul Haija, 22, from al-Qassam Brigades and son of detained Hamas leader Sheikh Jamal Abul Haija, Mahmoud Abu Zeina, 24, from Al-Quds Brigades, and 22-year-old Yazan Jabarin. PIC's reporter said seven men were injured and were moved to a hospital in Jenin. One of them Qassam Jabarin, aged 25, was seriously wounded and is in critical condition, the correspondent added. He later succumbed to his wounds. He said a large number of Israeli troops surrounded a house, since the early morning hours, in the camp where Abul Haija and several Palestinian resistance fighters barricaded themselves. Armed clashes erupted for hours between Israeli troops and Abul Haija, after he and his friends refused to surrender, and the Israeli soldiers showered the house with gunshots. PIC's correspondent added that other confrontations erupted between the Israeli soldiers and many Palestinians youths who rushed to the house and tried to end the Israeli siege, which led to dozens of cases of suffocation. The Israeli radio confirmed that a number of Israeli soldiers were injured, while the residents in the Jenin camp asserted that an Israeli soldier was killed during the armed clashes. When Israeli troops withdrew from the camp, dozens of its inhabitants headed to the hospital, urging Palestinian resistance factions to take revenge and calling on the Palestinian Authority to immediately end peace negotiations with Israel. The foreign minister of Luxembourg on Saturday met with his Palestinian counterpart in Ramallah, a statement from the ministry of foreign affairs said. 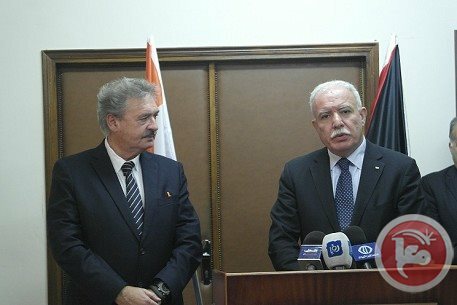 Palestinian Authority Foreign Minister Riyad al-Maliki updated Jean Asselborn on the latest developments in the Palestinian Territories, calling attention to "dangerous Israeli practices, especially settlement expansion and settler attacks on Palestinians and their properties in the West Bank." Asselborn said Luxembourg would exert serious efforts to revive the peace process on the basis of the two-state solution, the statement said. He reiterated his view that Israeli settlements mark a serious violation of treaties and international law. A member of the armed wing of Hamas was killed in "internal explosion" east of Gaza City on Friday, medical sources said. 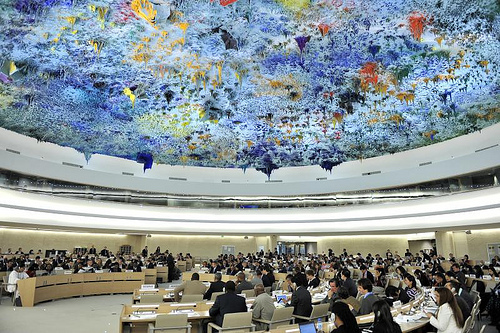 Palestinian delegation of non-governmental Palestinian and European organisations is currently in Geneva to participate in the Human Rights Council at its twenty-fifth session held on 28 March 2014, UFree said in a press release Friday. The delegation is planned to participate in number of workshops in order to shed light on the Israeli violations committed against the Palestinian people as a whole and Palestinian political prisoners and detainee in particular. UFree operations coordinator Khaled Waleed stressed on the importance of such visits to shed light on the plight of Palestinian political prisoners and detainees inside Israeli jails. Several meetings are scheduled to be held between the delegation members and European NGOs and pro-Palestine activists, in addition to attending a number of events in support of Palestinian political prisoners and detainees. Furthermore, seminar is going to be held on the plight of Palestinian detainees and Jerusalem issues on Saturday 22nd March 2014 at the Islamic Center in Geneva. In his turn, spokesperson for Youssef al-Sideeq Institution Mahmoud Lwese considered the delegation's visit an important opportunity to activate Palestinian detainees' issue in international forums. Lwese stressed on the importance of Youssef al-Siddiq's participation in the session especially that it would include the issue of Palestinian detainees from Palestinian territories of 1948 who are deprived from their basic rights in Israeli jails as part of Israeli racist policy, in addition to facing harsh sentences without any legal basis. 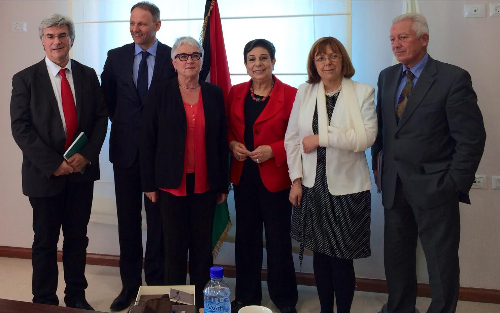 Ashrawi: "All Palestinians Are Living in a Prison"
PLO Executive Committee member, Dr. Hanan Ashrawi, met with a European Parliament ad-hoc delegation on Palestinian prisoners in Ramallah at the PLO Headquarters, and welcomed them to Palestine. Dr. Ashrawi said, "We thank the European Parliament for sending this fact-finding mission to investigate the conditions of Palestinian prisoners in Israeli jails, particularly the recent deaths of Palestinians in detention. It is our hope that this mission will help uphold prisoners' rights in ways that are in line with international humanitarian law, and that prevent the further injustice and torture of Palestinian prisoners." Both parties discussed Israeli measures pertaining to the Palestinian prisoners' situation, the abduction and arrest of Palestinian parliamentarians, the urgent need for the application of international and humanitarian law in the imprisonment of Palestinians and for Israel to held accountable. In the meeting, Dr, Ashrawi welcomed the European Parliament resolution of March 14, 2013 that called "for the immediate release of all imprisoned members of the PLC, including Marwan Barghouti." Dr. Ashrawi stressed, "With the arbitrary arrests of Palestinians and the torture of Palestinian prisoners in Israeli jails, Israel is in direct violation of international law and the basic norms of human rights. There is a global rule of law, and Israel must be subject to it." "We call on members of the international community that are signatories to the Fourth Geneva Convention to act on the basis of truth and justice and hold Israel accountable for its grave breaches of international law and conventions. It is high time for all states to put an end to Israel's systematic devaluation of the basic rights and lives of the Palestinian people. For there to be peace, there must be a recognition of parity of rights," Ashwari concluded. 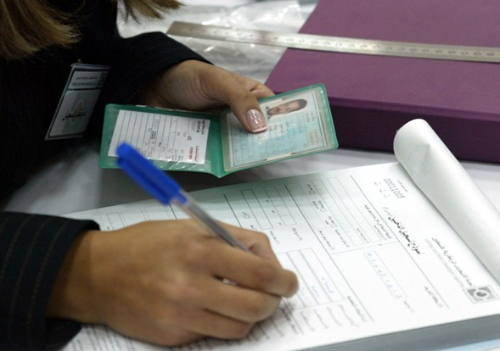 The Central Elections Commission (CEC) completed Thursday the voter registration drive which commenced last Sunday and targeted High school students who reached the legal age of registration (17 years or above) in all districts of the west Bank and Gaza Strip. During this operation the CEC registered a total of 56,678 students out of 67,924 students in both the WB and GS in coordination with the Ministry of Education and Higher Education. In the coming days, the CEC will progress in entering and processing of registration data through the Data Entry Center in Al-Bireh. The final registration numbers and total registration percentages are expected to be announced within six weeks. It should be indicated that registration is a periodic technical operation the CEC performs annually to ensure an accurate and up-to date voters' registry.